We love traveling the world with wellness guru's from all walks of life. Years ago we connected with Lena Franklin via Instagram - proof that technology can be used for good - and we've been following her own transformation ever since. Lena's latest interview in Where Traveler gives you a deeper look into her own journey. How did you get interested in meditation? It’s been a journey for sure. I’ve always known I wanted to be a therapist. I’m a psychotherapist by training, and come from a [family of] mental health professionals. My dad is a psychologist, I have two aunts who are social workers, so it was definitely all in the family. While I was in University my mom suddenly passed away, and she was really the one who taught me meditation and mindfulness. Once I experienced this loss, I really realized there is something more we can utilize for our own healing. Something beyond the traditional therapy hour, and that’s when I really started delving into yoga, finding my meditation practice and then I went on to do different trainings in mindfulness meditation. It was through my own experience that I felt how powerful it was, because it is really this way to be with all of our emotions, the ebb and flow of life, without breaking. The capacity to be aware, to honor our emotional systems and to be compassionate towards the self, all of those elements fit in, and there’s something really amazing here. I started my psychotherapy practice— a mindfulness-based practice where people come in and I do therapy and meditation instruction. That cascaded into doing retreats and mindfulness trainings and corporate trainings and talking more about mindfulness with companies and different organizations. For those who haven’t practiced meditation, or perhaps busy travelers on the go, where do recommend they start? I would say mindful belly breathing. Our belly area is where we feel grounded and where our intuition exists, and the energy there is usually very depleted when we are stressed, anxious or depressed. Most of us are under that category in some way. If we can wake up and do 5-10 minutes of belly breathing using an affirmative mantra—for example, inhaling, ‘I am’ and exhaling ‘at peace’ into the belly—and letting go of the tension there, just a few minutes of that practice can be transformational. Want to join Lena's next trip with Pravassa? Riding through Paris on a motorcycle. Hitchhiking the German Autobahn unsuccessfully then pitching a tent as the sun lowered across the horizon. Watching Yugoslavia’s summer rays beat down over the glimmering, cliff-side sea. I first heard of these adventures as a teenager and promptly made my father pull out the slides for proof that he was talking about the same people who raised me. Sure, I’d witnessed remote tribal villages through the pages of National Geographic as a kid – I knew there was more to the world than my small suburban existence. Yet imagining people so close to me exploring the other side of the world simply blew my mind. At 10-years-old, my uncle gave us a globe. I spent countless hours studying it, wondering what it would be like to live in the Soviet Union, East Germany or any number of places that no longer exist within the borders of an old map. I never imagined a life dedicated to travel, but hoped to explore as many of those places as possible one day. At sixteen I won a spot to compete in a volleyball tournament in Canberra, Australia. 4 flights and 30 hours later I was on my first international trip with a group of girls I’d never met. We lost the first day of competition, but it didn’t matter because I had made it to the other side of the world. I still remember five girls huddled for warmth in sleeping bags, waking up to snowfall during what was summer back home; running along the Australian Parliament House’s rooftop garden; coming face-to-face with a guy who had puzzle pieces tattooed all over his face in Sydney’s red light district; feeding eucalyptus to a koala bear in my arms; and exchanging addresses to keep in touch with new friends. Without social media to fall back on, I remember certain aspects of that trip so clearly because I was present for each moment. Traveling halfway around the world with no connection to home, experiencing new landscapes, animals, and people, and capturing them all with my father’s loaned camera (diligently loaded with film rolls and kept out of sunlight, of course). Want to travel with Linden? As the founder of Pravassa, she's often leading our group wellness vacations. See the latest trips here. We have no doubt you that you might recognize this romantic under ground space lit only by candles and the bathing pools from numerous TV shows and movies. With dramatic ceilings and warm toned brick you'll think you time traveled from the streets of NYC to ancient Europe. AIRE NYC is the first international outpost from the Spanish company. Spanning a 16,000 square feet subterranean level of an 1883 TriBeCa building, the space and decor is a nod to ancient Greek, Roman and Moroccan days where people gathered in thermal baths as part of their social life. The co-ed space requires bathing suits and strange spa slippers to be worn at all times for hygiene, but you quickly forget about this quirk. We slipped into an afternoon slot and descended a large glass staircase into the bathing area, which was almost empty due to the time of day. 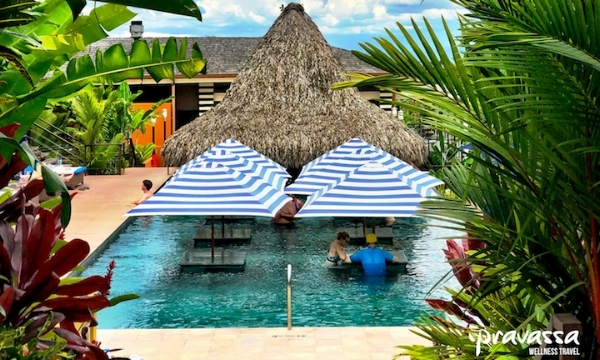 With a jet bath, 102° hot pool, the 98° warm pool, a 57° cold pool, a 50° ice pool, the salt-water bath, and the steam room - to move through as you please - we decided we should just move in. Massages are done in a walled glass space containing about 7 beds separated by curtains. Complementary water and hot tea are available throughout your session and bathers are notified of the end of the 2-hour session with chimes. In our dreamy state we must have missed the call as we overstayed our session, yet no one seemed to notice. Out the other night with friends, the topic of solo travel came up during dinner. My husband had just returned from a two-week solo adventure to Hawaii and I have been traveling solo for years. A friend commented that, while she has yet to travel solo, she dreams of the day when a solo getaway will offer her some much needed time to clear her head and think about her future. Actor and author, Andrew McCarthy describes solo travel in his book, The Longest Way Home, as the time when he feels most at home in himself. I couldn't agree more. Solo travel changes you. Being on the road alone, you are forced to confront your true nature. You depend on the kindness of others and step outside of your comfort zone in search of new, fulfilling experiences. It is liberating! Now that you're ready to pack your bags and head off on your own adventure, here are some tips and tricks that I've learned throughout my years of travel that not only make myself, but my family, more comfortable saying good-bye. Prearrange accommodations and transportation - My loved ones and I feel more comfortable when I'm able to leave behind an itinerary of where I'll be on which dates. Hotel phone numbers are handy especially if you're traveling to a foreign country or place where your cell phone may not work. Pre-booking a taxi or shuttle for my arrival saves me the stress of trying to figure out what to do upon exiting the terminal especially if I'm jet-lagged and in unfamiliar territory. That being said, there's nothing like going with the flow or taking recommendations from the people you meet while traveling. Therefore, I always make sure my reservations are refundable in case something better pops up. Plan arrival during daylight hours - As a woman who only speaks English, with a few key foreign phrases, I prefer to arrive at my destination during the day. If I have to wait for my bus or taxi I can at least get my bearings and feel a bit more comfortable as more people are usually around during the day. Respect the local culture - When it comes to packing, I do my research in advance about what is acceptable attire where I'm traveling. Typically I pack casual and conservative clothing or layers so I can cover up when needed. Since I'm not in the market for unwanted attention, good jewelry and revealing outfits stay in my closet at home. Make friends at your hotel - Spend some time talking with the concierge or hotel owners if they are around. Not only will you get some great local advice and perhaps a dinner reservation at a hotspot, but also you will develop a relationship that invests someone on the ground in your comings and goings. Often these people will keep a watchful eye out for anything amiss. Trust your gut - Often times we are so busy in our daily lives at home, we don't listen to our instinctual side, but on the road this is an important guide to your health and safety. If you find yourself in a situation that makes you uncomfortable in a threatening way, then excuse yourself and move on. If it's late at night and walking back to your hotel seems daunting, then grab a taxi. Your body has ways of warning against bad choices, you just need to tune in and listen. This article was written for and originally published on The Huffington Post. At Pravassa, we believe that committing to a wellness practice deepens ones travel experience. We asked five incredible wellness travel gurus to share their favorite place around the world to practice wellness. Scroll down to read about their experiences firsthand. My favorite place to practice yoga, meditation, breathwork and qigong is Bali. Here, you're completely immersed with nature, surrounded by lush jungle, exotic animals and natural beauty. I believe we become quite unwell when we lose contact with nature for too long. Most of us that have lived in cities for most (or all) of our lives are in deep need for communion with the elements of nature. We often don't even realize how badly we need this—just being in Bali does something incredibly healing to the mind-body system. Despite tourism on the island, the Balinese still live, eat, dress and uphold their traditions. It's beautiful and mystifying to witness. Yogis from around the world travel here to practice together with a like-minded community. Surfers and tourists come for the scenery, and others come for the healing. Bali teaches you to slow down, let go, enjoy life and be grateful for what you have—all things that lead to happiness. There’s something about Thailand that is very spiritual for me. While traveling throughout the country on my honeymoon, I felt so connected to the Earth, the people and the nature. I was even more in tune with myself. Practicing yoga just as the sun was rising over a lily padded lake at the Four Seasons Chiang Mai was one of those spiritually connect moments. I thrive from being outdoors, so having this practice at dawn added so much more to the experience. The rhythmic voice from the instructor mixed with the birds ringing in the morning and the breezes sweeping across my face, I felt totally transported and at ease. Wellness is infused not only the resort, but in the landscape of Thailand. There’s this overwhelming appreciation focus on being outdoors and on the energy of the country. My favorite place in the world to practice wellness is at The Rolling Huts, a modern camping alternative in Winthrop, Washington. The wellness modality that I practice there is simply unplugging and spending time in nature. The Rolling Huts a truly special place for me as I go every year with my husband to truly disconnect from the world for three nights. It's one of the few places I've found where nature is untouched in the Cascades National Park and the slow mornings on the patios of the minimalist cabins really grounds me. This time to "just be" has become an annual retreat for us, and it's something I look forward to every spring. Northern India is one of the most incredible places in the world to practice wellness, particularly at Ananda Spa. This beautiful hidden gem, placed in the Himalayan foothills, is truly a one-of-a-kind wellness spa experience and offers a variety of amenities for their guests. Among one of my favorites is the focus on the healing properties of Ayurveda. Ayurveda is one of the oldest systems of medicine in the world and is based on the belief that health and wellness depend on a balance between the mind, body, and spirit. 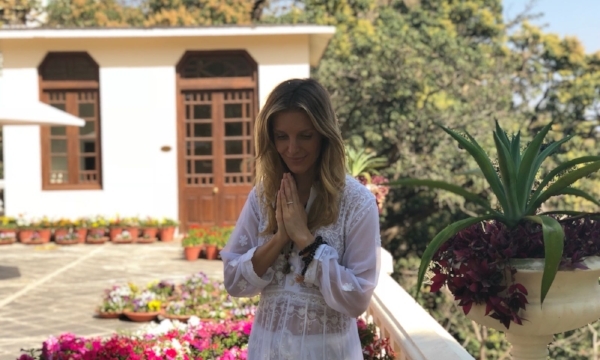 If you are looking to fulfill your personal goals or make a commitment to a big transformation in your life, the Ayurveda experience is magical. Two of my favorite Ayurvedic healing practices include Abhyanga, a traditional synchronized full body massage given by two experienced therapists using Sesame oil, and Pizhichil, a rejuvenating experience during which lukewarm herbal oils anoint the entire body. Whether it is to heal, cleanse or relax, there are a multitude of amazing experiences at Ananda in northern india. 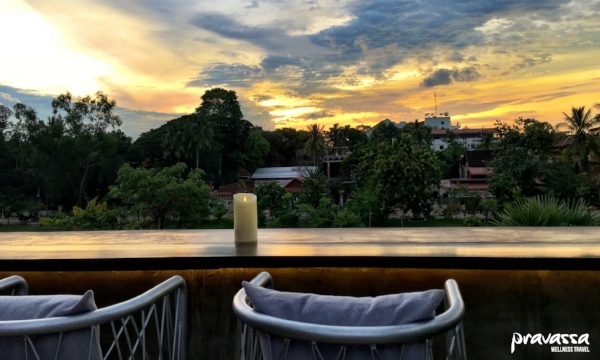 My favorite place in the world to practice wellness is in my maternal homeland of Vietnam, and Mindfulness meditation is the practice that I immersed myself in while traveling there. Because most of the country is Buddhist, I like to seek out temples where I can sit, get still and absorb the ancient spiritual energy. Practicing meditation in this part of the world where it originated is transformative on multiple dimensions. The devotion and dedication that the Mahayana Buddhist monks have for walking the path of peace infuses into your cells and you return home renewed. Vietnam is the land of my ancestors who went through centuries of war and struggle. To feel the energetic resilience of the Vietnamese people will ground you into the heart of humanity. Journeying through Vietnam is a moment-to-moment meditation no matter what you’re doing. Vietnam’s diverse landscape, from the rice paddies of the delta in South Vietnam to the limestone mountains of Ha Long Bay in the North, make it a country of tremendous natural beauty. Pair this beauty with the heart-centric welcoming nature of the Vietnamese people and spiritual depth of their Buddhist culture and you receive the alchemy of transformation through presence. 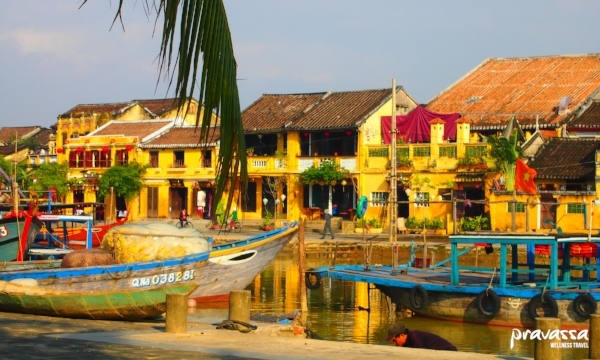 Everywhere you turn in Vietnam, you are greeted by warm smiles and wafting incense billowing out of homes and temples. Your senses will take in the Vietnamese culture, awakening your heart to interconnection and love. My favorite place in the world practice wellness is Nimmo Bay in British Columbia. Once a fishing lodge when it opened over 30 years, Nimmo Bay has long since evolved into one of the world’s most exclusive and luxurious wilderness resorts. Accessible only by float plane or helicopter, there is a deep sense of seclusion, peace, and privacy. In this natural and remote location, you’ll feel a unique harmony with the elements around you—which makes it a magical place to practice mindfulness, reconnect with your body, and emerge feeling renewed. This can be enhanced by Nimmo Bay’s wellness offerings that include a holistic therapist, reiki master, intuitive, and masseuse; the resort even has a floating sauna, which sits on a raft in a secluded bay where you are dropped off and picked up by boat. From outdoor showers to body balancing treatments along with guided meditation, you'll feel at one with nature and be able to focus on your self-care. Oh, and don’t leave without taking a dip in their hot tub, located directly next to a powerful waterfall that flows with cold water from a snowpack at the top of the mountain a few thousand feet above. The list is out! CNN's has crowned the World's Most Relaxing Places and we're thrilled to say that we can send you to 6 amazing ones that made the cut. Let us help to you take relaxation a step further, by planning the entire getaway making the most stressful thing you have to worry about: what to pack! For Wellness aficionados ready for a glass of green juice overlooking endless rice fields, a built in yoga community, and local healers. For spiritual seekers in search of tranquil relaxation amidst a series of shinto shrines known as the "soul of japan". For Nature Lovers ready to explore wildlife, impressive volcanoes, and time just sit in the hot springs or your own private plunge pool. For adventurous travelers seeking a gateway to the ancient world of angkor wat, magical sites, trendy cafes and jungle ruins. For laid-back explorers ready to slow travel the beguiling riverside, admire exquisite architecture, enjoy traditional boat rides and afternoon bicycle tours. For beach lovers WHO CRAVE supreme surfing conditions, powder white sand and a relaxed, down to earth vibe. Nyepi Balinese New Year: The "Day of Silence"
While many countries ring in the New Year with loud parties, fireworks and celebrations, the island of Bali takes a different approach: 24-hours of complete silence, known as the Nyepi holiday. The holiday starts with the Ogoh-Ogoh parade. For months leading up to Nyepi, young men from each village gather and pull their artistic skills to create monsters, known as Ogoh-Ogoh, from light materials such as wood, bamboo, and paper. As tradition goes, the Ogoh-Ogoh get paraded down the streets after sunset to call out the spirits on the island. After a festive ceremony of music and dancing, the monsters are then burned in an effort to release the ashes of the spirits and to cleanse the island for another year. Once set free, the island falls silent for a day— the airport closes down, Internet is not accessible, and you are not allowed to leave your home or hotel; this is a sacred day of meditation. Experiencing Nyepi in 2018 with Pravassa's Journey Into Wellness small group trip. Pravassa travelers head over to the village ceremony. Locals perform temple rituals to appease demons that they believe represent the destructive forces of nature. Pravassa guests gather in traditional Balinese dress to excitedly witness their first Nyepi holiday. The young men design and create their Ogoh-Ogoh. Then after sunset, the village parades them through town to call out the spirits. Pravassa travelers gather with Balinese locals to celebrate the holiday. Before you begin to clear the spirits from the village, you must first clear them from your home and your land. All participants in the procession will wear a traditional Balinese costume. Pravassa travel experiences include participating. Here a guest plays a local bamboo instrument in the parade. After the village bell, participants gather for the parade with the children leading the way. As the entire village gathers, Ogoh-Ogoh are carried through the streets, often by 25 men. In a ritual dance, locals call out to raise the spirits before the burning of the Ogoh-Ogoh. Post parade and dancing, Ogoh-Ogoh are carried to the edge of the village and burned in a ritual, which will cleanse the island for another year. A Pravassa guest spending quiet time in nature during Nyepi day. Pravassa travelers take in the Nyepi holiday in all of its sacred glory. This special holiday demands 24 hours of silence, where all restaurants and shops are closed and internet is turned off. Whenever we hit Asia on our must do list is visit temples, temples and more temples. The history and cultural significance of each beautiful place has provided many #changedbytravel moments over the years. AFAR Magazine did a round up of 26 Amazing Temples Around the World, which has us reminiscing about our jaunts through India, Thailand, Indonesia, Cambodia, and Japan. Want to experience these beauties yourself? Start planning your customWELL vacation now!